The beauty of this compact, tri-view mirror isn’t just that it gives you a 180-degree horizontal view—though that’s excellent for doing your hair and makeup. 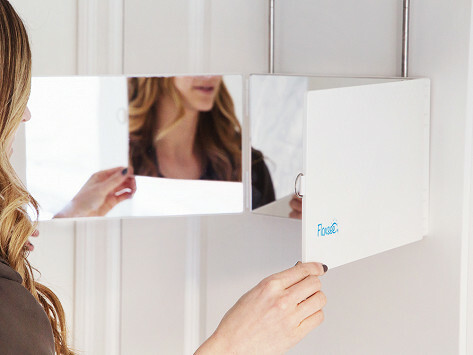 Flip it vertically in a pinch and it functions as a foldable full-length mirror. An adjustable hook hangs it from doors, shower curtain rails, or wherever you need a better view of all of you. Dimensions: Closed: 12.5" x 7.75" x 1.125"; Open: 36.5" x 7.75" x 0.25"
This mirror makes it so easy to check out the back and sides of my hair every morning. This mirror is a dream come true. Now I can see the back of my head while styling it. It fit nicely over my bathroom door. Perfect. Lightweight. LOVE, LOVE, LOVE this mirror! This compact, tri-view mirror makes seeing the big picture—whether on the go or in a tight space—easy. Hang it vertically from its adjustable hook—like on the back of a door or a shower curtain rail—and it gives you the same view as a full-length mirror. Or, for a 180-degree view of your hair and makeup, hang it horizontally. Friends Deena O'Neill and Ellen Hollin created Floxsee after they both cut their long hair to donate to charity and found styling their new short hairdos tricky, particularly in the back. They have maintained their giving spirits, and donate 5% of Floxsee proceeds to the Cystic Fibrosis Foundation and Fox Chase Cancer Center. Both ladies traveled frequently, too, so their dream mirror had to be compact enough to take along. Their design is surprisingly slim when folded, making it perfect for hotel stays, getting ready at the gym, or any place where a good mirror can be hard to find.